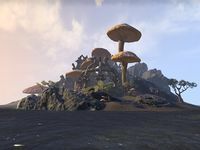 The Sheogorad region is a wild maritime province consisting of about 28 islands off the north coast of Vvardenfell, Morrowind. The high pillar-like menhirs characteristic of the area also result in hundreds of rocks, either just exposed, or lying just below the surface, which makes marine navigation almost impossible. The only accessible port, Dagon Fel, is on the main island of the archipelago, reached by skirting the region and coming in from the north. Sheogorad is politically non-aligned. Its remoteness and the difficulty of travel puts it beyond the reach of most of the current Great Houses, although the large number of ancient Velothi buildings, Dwemer ruins, and Daedric shrines through the region, and along the north coast of the mainland, bear witness to the fact that this was not always the case. 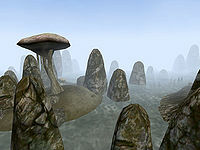 During the 3rd Era, however, Sheogorad is a haunted region, full of sorcerers, vampires, witches and Daedra worshippers. The port town of Dagon Fel is the only real settlement in the region. Its population is far more heavily Nord than most of Vvardenfell, a part of the heritage of that seafaring people. While Dagon Fel is the only place in the region that has any suppliers, the major occupation of the inhabitants is scavenging in the local ruins, which extend into the town itself. The main body of the Dwemer ruin of Mzuleft is south of the town, separated by walls and a steep range of hills, but the Dwemer towers and ruins are virtually part of the eastern town, and extend to the island to the north. On the far south of the main island, also called Sheogorad, is the ancient stronghold Rotheran, openly inhabited by a bandit gang as of last report. There are numerous caves in the area, and several crypts, though many are inhabited by necromancers or vampires, and there is known to be a place of worship frequented by Orcs somewhere on the west of the island. The small Shuran Island can be found off the south coast of the main island, west of Rotheran. The surrounding islands are much the same: dens of bandits, sorcerers and vampires. There are two very large Daedric shrines: Ald Daedroth to the far east, and Assurdirapal on a long island in the west of the chain, which also holds the significant Velothi ruin of Ald Redaynia. While many sites throughout this region are given over to the profane, the dead, and the deadly, Sheogorad is also known for its religious mystics, and hermitages on the islands are common. The northern islands in particular are places of retreat, since the forces of "darkness" seem more inclined to live on islands closer to the mainland. In fact, a northern island contains the Sanctus Shrine, the site where the current Archcanon Saryoni did his meditations and wrote his famous sermons. This page was last modified on 20 January 2019, at 17:03.